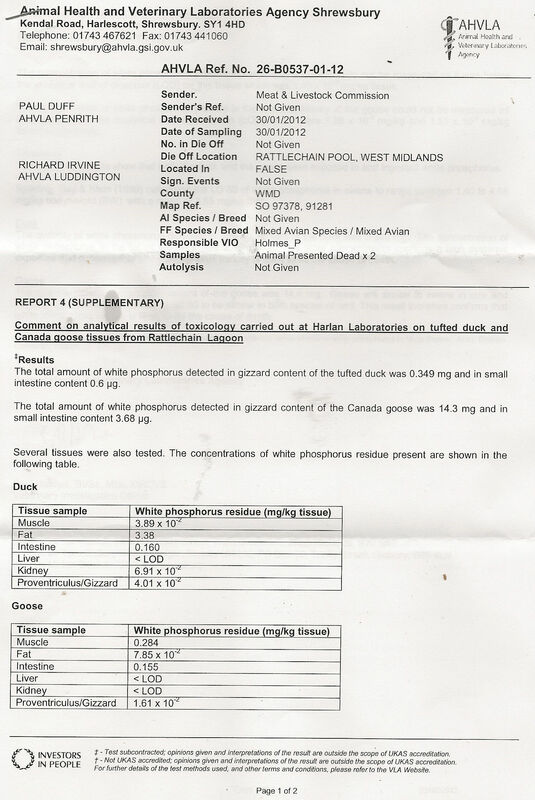 WHITE PHOSPHORUS CONFIRMED POISONING IN RATTLECHAIN CANADA GOOSE. 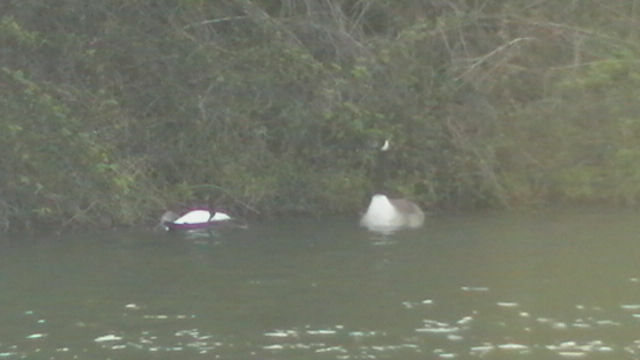 On 4/4/11 a dead Canada goose was observed on the pool. Rhodia again collected the carcass and once again the VLA found no explainable cause of death. Their reference number given was 26-B0061-04-11. 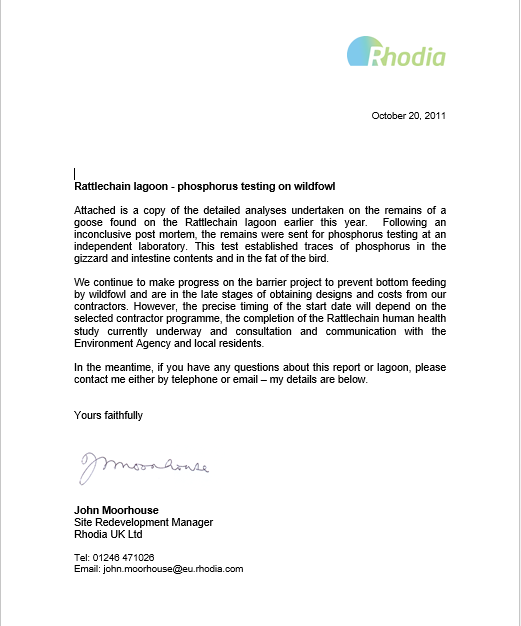 After several unexplained months of delay from collecting tissues from the VLA for P4 analysis at Harlan, Rhodia finally released the report to us in a letter dated 20th October 2011. This report was the most significant to date, which not only confirmed exposure to white phosphorus, but also P4 present in fat tissue. “SYSTEMIC EXPOSURE” WAS THEREFORE CONFIRMED. This report can be read below. The VLA interpreted the report following disclosure. Accompanying the Harlan report, the letter from Rhodia’s site redevelopment manager John Moorhouse and sent out to local residents did not appear to acknowledge the importance of this, but instead brush over it by talking about the proposed “barrier” works, rather than tackling the problem of the poison that killed the goose being present in the lake in the first place. There was also no distinction into saying WHITE PHOSPHORUS being present- WAS THIS A CLEAR ATTEMPT TO DECIEVE THE PUBLIC? Unfortunately this appears to be typical of Rhodia employees and their supporters in denial of their plant operations causing harm in the Oldbury community. The opinion of Marian Walsh and Professor Bill Roebuck who had been involved in the Eagle River Flat white phosphorus poisoning investigations in Alaska, (cited in the VLA report), was again sought. “I looked at the report and I agree with Marianne mg quantities of P4 is a lot. Additionally, P4 was found to be absorbed into the animal. That is it was in the body fat also. Had another fatty tissue such as brain been taken they might also have found P4 there. P4 is soluble in organic media such as body fat. IT SHOULD BE NOTED AS EXPRESSED PREVIOUSLY BY THESE US EXPERTS, THE AMOUNT DETECTED IN THE BIRDS WAS NOT THE AMOUNT THAT THEY ACTUALLY INGESTED TO POISON THEM. 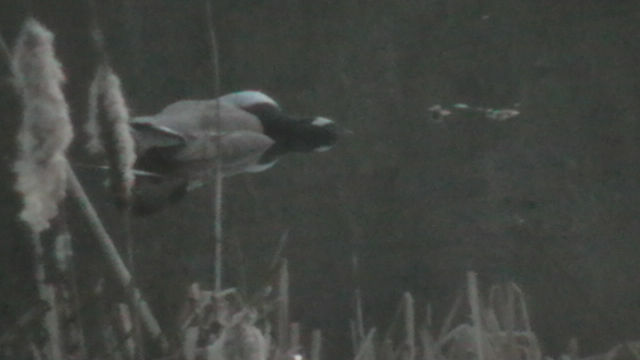 The carcases of a male and female mallard were found dead on the pool on 15th September 2011. Click to see the video of this below. Rhodia again collected the carcass and once again the VLA found no explainable cause of death. Their reference number given was 26-B0300-09-11. 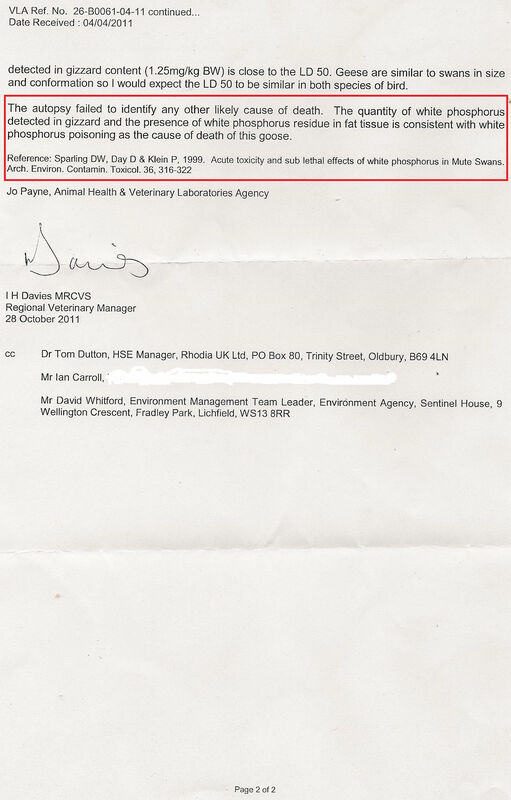 After considerable and unexplained delay, Rhodia finally revealed the Harlan laboratory report in March 2012, the white phosphorus analysis only having been carried out in January- three months after the death of the birds. 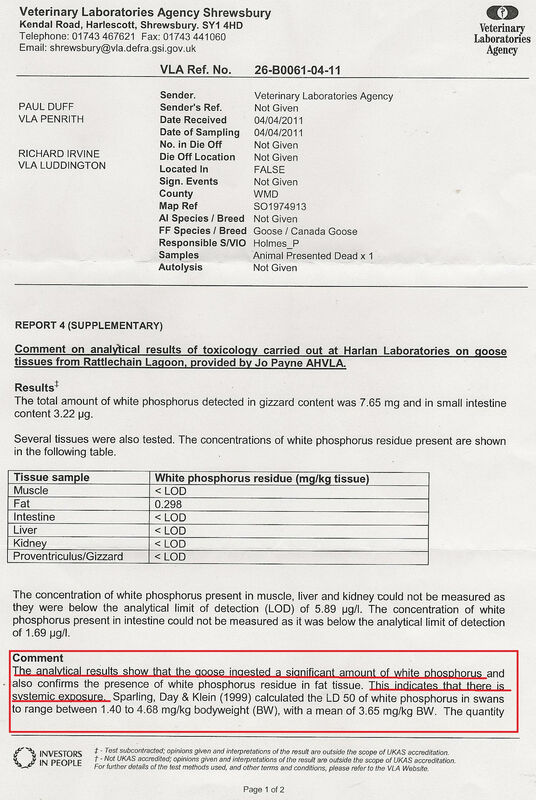 Despite what we believe to be a deliberate attempt to subvert the evidence of white phosphorus evidence being present in the remains, enough white phosphorus was “found” in several tissues. Read the Harlan report below. Accompanying the Harlan report was Rhodia’s standard brief and indecisive description from John Moorhouse, which once again failed to relay the importance of the result and also mention the poisonous chemical in question that had caused their deaths- white phosphorus. A dead female Canada goose and subsequently discovered dead tufted duck drake were collected from the lagoon on 30th January 2012. As before Rhodia took the carcasses to the AHVLA at Shrewsbury and both birds were given reference 26-B0537-01-02. Completely unsurprisingly no cause of death could be identified on gross post mortem tests and so samples were taken of selected tissues and frozen for subsequent P4 testing. Significant delay in the collection of the tissues for analysis at Harlan was not explained by Rhodia, but the time delay was not acceptable. 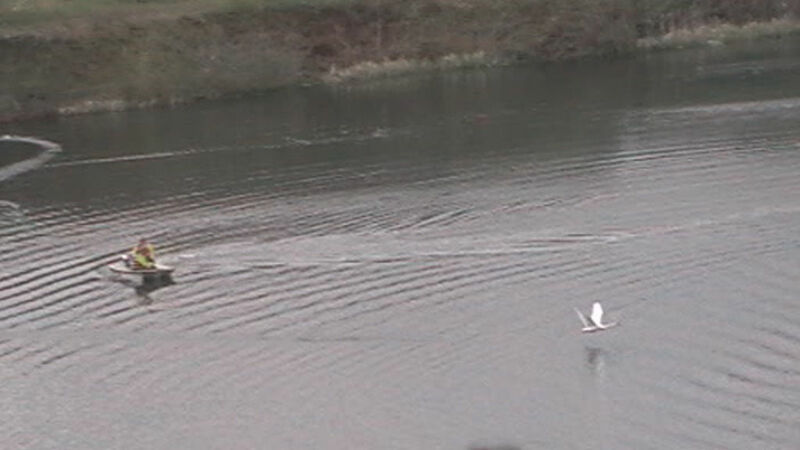 Another dead swan (see below) was also tested at the same time. Despite this however both the two smaller birds were confirmed to have been exposed to white phosphorus and systemically exposed. The Harlan report can be read below. 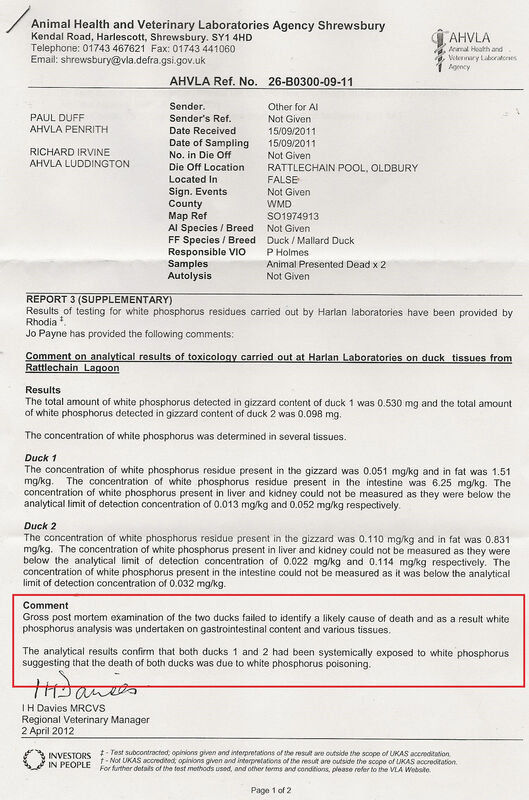 The VLA interpreted the report in respect of the tufted duck and goose. WHITE PHOSPHORUS CONFIRMED IN ANOTHER DEAD RATTLECHAIN SWAN. 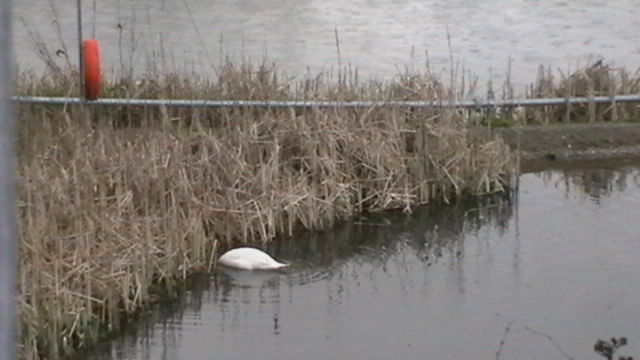 In spite of the Natural England licensed removal by the RSPCA of a pair of swans in March 2012 that had started to begin making a nest at the lagoon, another pair of swans quickly replaced them, again starting to look like nest building. 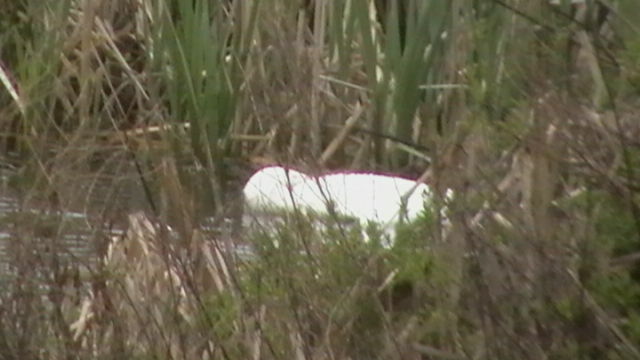 The male swan in particular was noted to be feeding in the smaller lagoon amongst the reeds on 12/4/12. Remember this supposed “clean side lagoon” was originally part of the same waste dumping pit, before waste licensing, and before Albright and Wilson had stopped making P4 at Oldbury. The HPA in their “human heath risk assessment found more of the chemical in the sediment in this side than the other. In addition to this, despite claiming that they would collect the carcass the next day, this also did not happen, Only after 48 hours later after it was noticed dead did Rhodia collect the dead bird and take it for post mortem at the AHVLA at Shrewsbury. 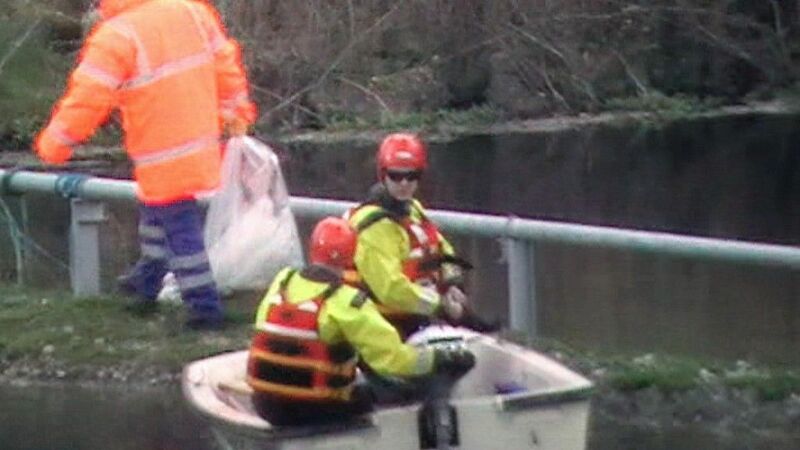 At the same time the surviving female was chased off from the lake by the speedboat. 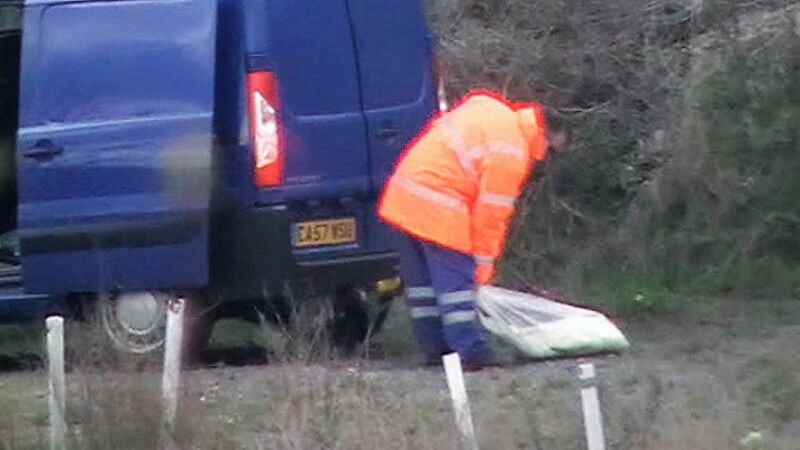 This bird was again found to be in good condition with no obvious cause of death found on gross post mortem. Given AHVLA reference 26-BO406/4/12, significant delay in testing for P4 at Harlan laboratories was again encountered without any explanation given. The Harlan report for this bird can be read with the other two dead birds tested at the same time. The comment given by the AHVLA here is erroneous, because they cannot claim the amount swallowed by the bird was “small” by virtue of the amount found, months after death. We asked Marianne Walsh about this and her comment below supports this view. A table of the 12 birds tested for, (5 different species),and subsequently confirmed found to have ingested highly toxic white phosphorus can be found below. 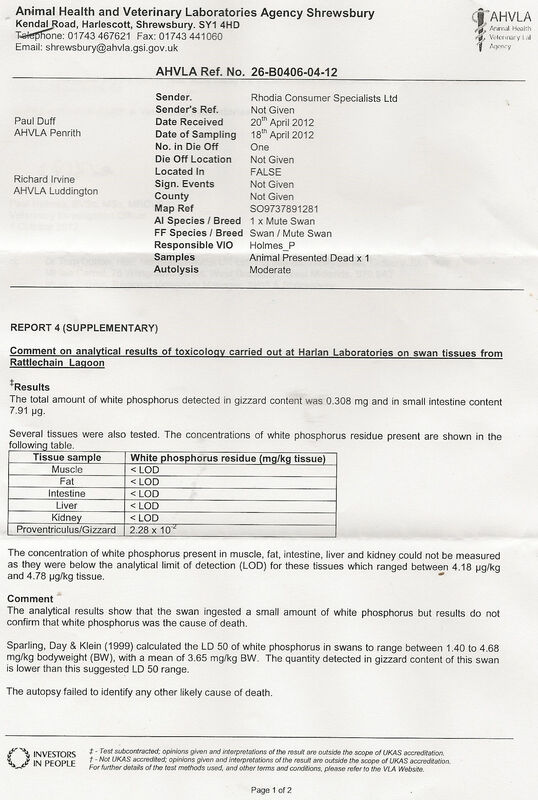 Two main concerns emerge for us as laymen concerning the testing of white phosphorus tissues at Harlan laboratories. 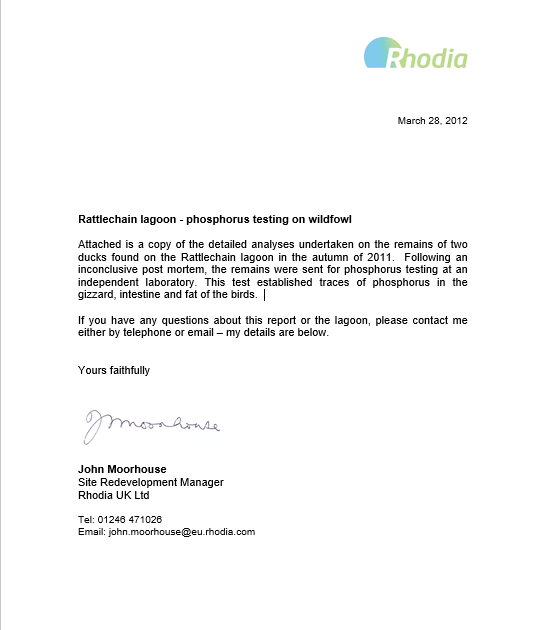 THE TYPES OF P4 USED IN THE TESTING PROCESS SUPPLIED BY RHODIA AND THE FACT THAT THESE APPEAR TO DIFFER IN CONCENTRATION AND AMOUNT BETWEEN DIFFERENT TESTS- DOES THIS MATTER? Marianne Walsh has seen this table and all of the Harlan reports, from which most of the data has been taken. She was asked for her opinion of the analysis carried out and has clarified some of the concerns. “To answer your questions below, we did analyze tissue from ERF birds in a much more timely manner. In fact, in the early days of ERF, we had a gas chromatograph on site and analyzed tissue within a day or two of collection. I must emphasize that the absolute concentration found in the tissues is not the real issue. The fact that P4 was detected is an indication of exposure to an acutely lethal chemical. The amount detected is only what is left over after the lethal dose has poisoned the bird (that is excess amount above the lethal dose). Iso-octane is the solvent used to dissolve P4 to introduce it into the gas chromatograph. It is fine for most samples and it is the solvent we use. However, we do not use it for such high concentration standard solutions because we found high concentrations to be unstable. The method we developed is attached. Section 5.8 concerns calibration standards. We used toluene for high concentrations. Benzene is fine too for this application, but we avoided using it because of the health hazards associated with it. Many labs won’t allow it to be used. The fact that different concentrations of standards were used (922 mg/L or 2233 mg/L) does not matter as long as the concentrations were known. Standards of known concentration are used to calculate response from the gas chromatographic detector per unit of P4 concentration, which is then compared to the detector response from tissue extracts. We used P4 obtained from Aldrich Chemical Company in the US. It was 99% pure. P4 is made today in only a few countries (China mostly) and Kazakhstan apparently still has a manufacturing facility. The lad in the UK probably used the Kazakhstan P4 because that is what they could get. It is probably just fine for this purpose. To sum up, there is some concern about the long delay between collection and analysis of the samples. The standards may not be stable in isooctane. Both these issues may lead to an underestimation of P4 concentration. However, the major issue is that P4 was detected, proving that the birds were exposed to P4. Given the high toxicity of P4, and if no other cause of death is identified, I would have confidence that these birds were poisoned by P4. 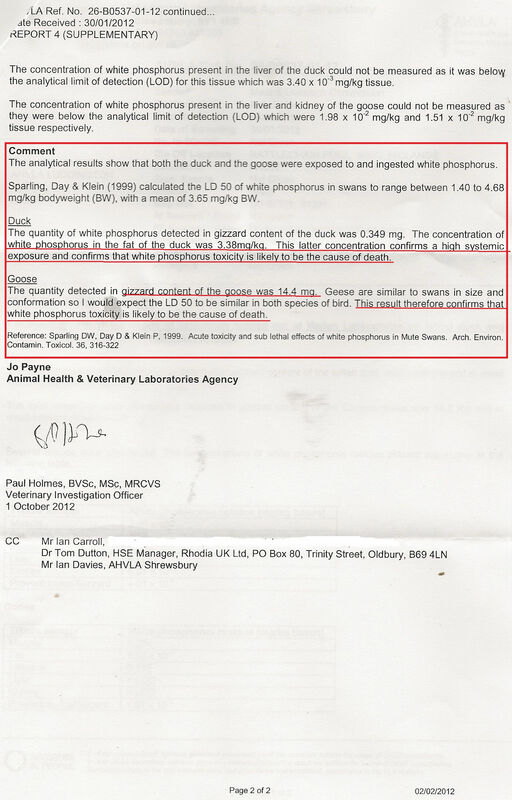 WE WOULD LIKE TO THANK THE EXPERTS FROM THE UNITED STATES WHO HELPED CONFIRM THE CLEAR LINK BETWEEN WHITE PHOSPHORUS POISONING IN WILDFOWL IN AN ENGLISH HAZARDOUS WASTE DISPOSAL SITE, AND NOTE THE ABSENCE OF CREDIBILITY OF AUTHORITIES IN THE UK WHO COULD NOT.